From this subsection, you have the possibility to set the background of the footer. You can choose a certain background type, set some values for the footer spacing, show an overlay, show a footer border and use footer parallax. 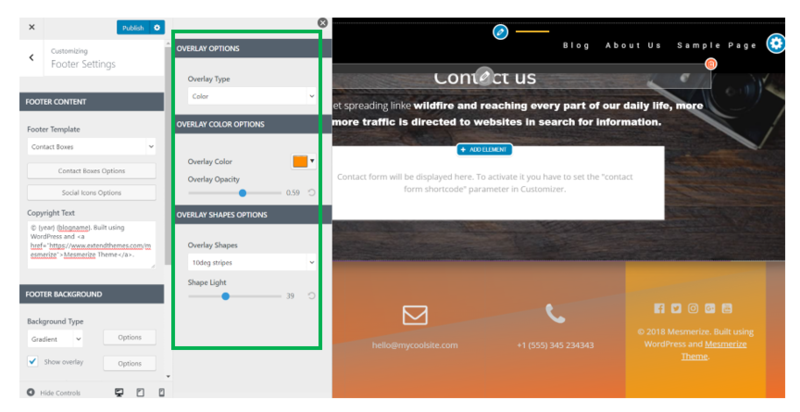 Color – click on Options and a customization panel will open. Choose a solid color for your footer background. Experiment with any of these 3 image sizes and see what looks finest. Gradient – choose a gradient type background and click on Options. A panel will expand, where you can select the gradient of your choice. The overlay is a semi-transparent color/shape that applies to the background and gives a nice visual effect. Check the checkbox Show overlay, if you want to apply an overlay to the footer background. Leave the checkbox unchecked if you do not want to display an overlay. Once the button checked, the Options button will appear. Click on Options and a customization panel will expand. This subsection refers to the distance of the footer from the top and to the bottom. The values are given in pixels, but you can also set them in percentages. This feature allows you to add a solid upper border to the footer section. Check the checkbox in case you want to add a clearly defined upper border to your footer. 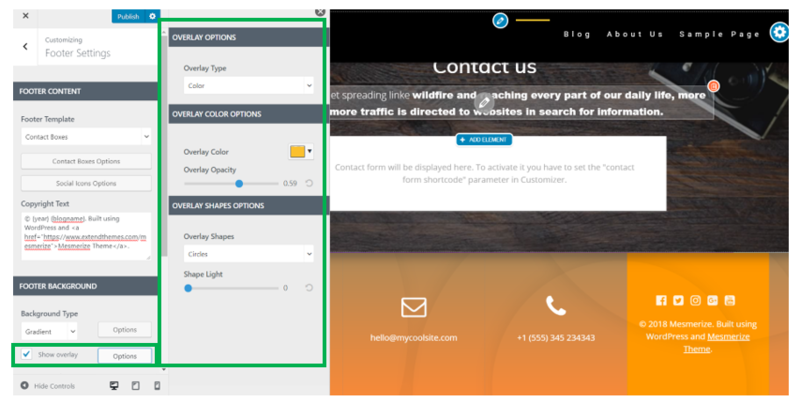 Leave the checkbox unchecked if you do not want to display an upper border to the footer section. A parallax effect consists of a slightly hidden background that stays in place, and as the foreground moves, you continue seeing the still background until the entire foreground is covering it. Check the checkbox to enable the footer parallax effect. Leave the checkbox unchecked if you do not want any footer parallax.